(From Nikon lens literature) In addition to Nikon's standard retractable design AF-S DX NIKKOR 18-55mm f/3.5-5.6G VR II kit lens, Nikon has now added the ideal companion 3.6x zoom lens to help take DX-format photographers from wide-angle to telephoto with ease. Compact and lightweight, the new retractable design AF-S DX NIKKOR 55-200mm f/4-5.6G ED VR II is great for capturing sports, people or school events, and presents an affordable way to get closer to the action. The lens also features three stops of VR image stabilization and core NIKKOR technologies including a Silent Wave Motor (SWM) that helps ensure quiet and precise AF operation. 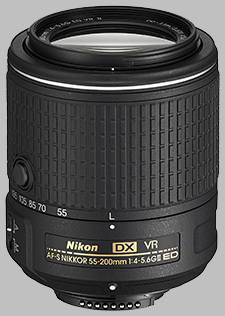 The AF-S DX NIKKOR 55-200mm f/4-5.6G ED VR II lens will be available in early February 2015 for an SRP of US$349.95. I have a D90 with two FX lenses that have served me fairly well over the last 7+yrs, the AF-S 50mm 1.4 G and the AF-S 70-300mm 4.5-5.6 G ED VR. I have thoroughly enjoyed the 70-300 for many outdoor/nature/sports photos; the sharpness (from 70 to about 220mm) and speed have been great. The 50 has been a little less enjoyable; its just not as easy to get sharp photos at the wider apertures allowed by this lens. I saw this 55-200 for an impossible deal last night while out shopping for something else ($250 off...making it $98...NEW). I checked a couple of different lens review sites before taking the last lens the store had. I spent all morning today doing direct comparison shots between the 55-200, 50 1.4, and 70-300. I shot the same subjects at the same settings (at least those covered by the 55-200). I wanted to conclude that the shots taken from this $98 lens would be noticeably inferior to those taken from my $500 lenses, but I have to admit that it was extremely difficult to see any difference in quality. If zoomed and cropped to the smallest pixels you can analyze then yes, the 70-300 is just barely sharper at 200mm than the 55-200 (at all other settings less than 200 the difference is negligible). But the VR II feature of the 55-200 is actually a little better than the VR of the 70-300. At the shorter end of the spectrum (55mm), the only discernible difference is that the 50 shoots a bit brighter than the 55-200. The sharpness of the 55-200 is at least as sharp (if not sharper) than the 50 at the 55mm end of the range. In summary, if you have a DX camera then this newer 55-200 lens (with VR II) will serve you extremely well for little cost if you already have a wider lens to compliment it (like the 18-55 or 35). I planned on having to take this 55-200 back but it's now a keeper for my DX camera. Cheap, fast autofocus, excellent VR, very sharp, small and handy when collapsed. I used to have the earlier 55-200 VR lens, but gave it to my granddaughter, because it was so light that even with VR it was hard for me to hold steady enough for good images. This one turned up at a good price, so I decided to buy one to use with my little D3300 as a knockabout companion to the 18-55. My first task was to compare it with my 55-300 VR. So I took identical shots on the D3300 and D7100, at 55mm, 100mm and 200mm, with and without a Kenko 1.4x DGX TC. If there's a resolution difference in any identical pair, between the 55-200 VR II and 55-300 VR, can't readily see it. I'd say that resolution on both cameras at all overlapping focal lengths, with and without TC, is virtually identical. The good news is that this lens has much faster autofocus than the 55-300, and somewhat better VR. I don't know where all of these "4+ stop" figures come from. But both lenses have good VR, and the 55-200 VR II is a little better. From a seated position, indoors, I was able to get keepers at 1/5 and 1/3 second. They aren't astonishing crisp, but they're completely acceptable, and that's a slow hold. More good news relates to use of the lens with the Kenko 1.4x TC. It works great. In fact, I'd say that this lens, at 200mm + Kenko TC, i.e., net 280mm, is sharper than the 55-300 at 280. But then the resolution of the 55-300 drops off fairly rapidly above about 200mm. I don't use it above about 210. Another nice feature is that the lens collapses. This means that I can walk around with the D3300 and this one or the 18-55 on the camera, with the other in my pocket. The bad news is that this lens is so light, especially on the little D3300, that it's hard to hold steady, especially in a breeze. Good VR can only go so far if the camera/lens combination is being blown around. So I wouldn't use it in anything like a gusty wind, especially out at 200mm....with a TC. Because it's an inexpensive made-in-China lens, the mount is plastic. That might bother some people. But in 48 years of taking pictures, I've never broken a lens mount. But I guess it happens. All in all, for the price it's really hard to beat. I'm glad I have it and plan to use it a lot with my D3300. Lightweight, compact, astoundingly sharp, great bokeh, parfocal, highly effective VR, dirt cheap if you get it refurbished in a DX camera/2 lens kit. This is perhaps the best bang for the buck for a telephoto lens out there in the APS-C world. It's tack sharp corner to corner at wide open apertures and from wide to long FOV, suffers from almost no chromatic aberration and has negligible distortion, plus it's parfocal, so it stays in focus as you zoom in or out when doing videos. It's almost optically perfect, apart from it being a variable aperture design and, at f/5.6 on the long end, pretty dark, but given the great high ISO performance of all modern 24Mp Nikon DX bodies, it all works out Ok, at least in good lighting conditions. Physically the lens is very compact when retracted and very lightweight. Although you do feel that there is quite some glass inside, the materials used for its body do make it feel cheap in both form and function, with a not very smooth zoom action that is sometimes draggy and a MF ring that's too quick to turn and has absolutely no resistance or weight to it. The plastic mount is definitively something you must take good care of, otherwise a wrong mounting will easily break a bayonet tab off the lens. It also doesn't have a rear rubber seal, so avoiding water splash is a must. VR is very effective, much more so than the 70-300mm VR's that I previously owned and unloaded as soon as I discovered how great this 55-200mm VRII is, but since you will most likely be shooting moving subjects with this lens, you'll be using high shutter speeds anyways, but it's great to have, especially for filming videos. AF is fast enough and quiet enough for video use with an external mic, but it's not as fast nor as quiet as the 70-300, but for my usage, which is mostly taking pictures and videos of my kids, it's good enough for me. This lens is a perfect pairing for a lightweight carbon fiber DX body like the D3300/D5300/D5500, and you just can't go wrong with its price. Imaging Resource should do a review on it to validate my findings, as I have also owned the previous version of this lens and it was nowhere near as great.